Bron Y Bryn Lodge. Sleeps 12 (plus separate cottage for 6). A very unusual picturesque house standing in semi enclosed gardens. Panoramic and majestic sea views of the Irish Sea, the Snowdonian Range, Llandudno Bay and the Great Orme and Little Orme in the distance.Only 28 miles from the Roman city of Chester with its historic ampetheatre reputedly to be connected to King Arthur. 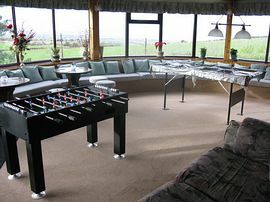 A very spacious lounge seating 12 leading into a lovely semi-circular conservatory overlooking the sea and beaches and Snowdonia, containing a full size pool table, air hockey and football table game to amuse you on wet days. 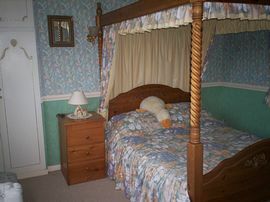 All bedrooms are en-suite and have lovely views of the hillside. Dining room with dining table seating 12 and adjoining kitchen. A ramped access at the front of the property. A very well appointed house for touring the area. The Roman city of Chester being only 28 miles away, here you can walk around the City Walls,Chester Cathedral and Roman remains within the City Walls. Magnificent Chester Zoo with its new arrival of a baby elephant. LLandudno Bay and Great Ormes approx 15 miles The lovely Isle of Anglesey only 50 miles along the A55.Colwyn Bay Welsh Mountain Zoo.Snowdon Railway Conway Castle Penrhyn Castle Beaumaris Castle many National Trust places in the area. The A55 expressway just under 2 miles from the property. Very close to all amenities but in beautiful countryside location. Well away from the maddening crowds. The views from every part of the house are stunning.An ideal place for a special holiday with your family. A three bed all ground floor accomodation which can be booked in conjunction with Bron Y Bryn Lodge at discounted rates or can be booked seperately. Please contact owner for details. Private entrance, parking area and rear garden. 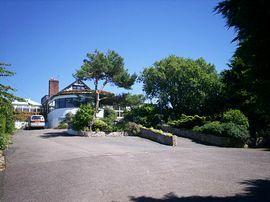 Wonderful panoramic sea views from the lounge and conservatory. Steps to front of property but rear access suitable for assisted disabled guest. A lovely quiet and peaceful rural area. We provide all linen but not personal towels. 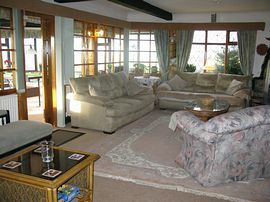 Patio with furniture overlooking the sea, Snowdon Range, Llandudno Bay and the Ormes. Local Services: A very quaint Village Pub and restaurant only half a mile from the property.Village shop and post office.Squash courts and leisure centre.Golf Course 1 mile away. From the A 55 go off at Junction 31 marked Dyserth/Prestatyn to the A 5151.Turn left at the second roundabout through the village of Trelawnydd and past the Crown Inn on your left.After the village school you will see a red 30 mph sign painted on the road after this there is a right turn marked Gwaenysgor (sign on left ahead says Bryniau)turn right down the lanes to crossroad turn left at crossroad as soon as you see the sea view on your right pass the two black gates(back entrance) and look out for the car park on your left turn in and park. £200 daily minimum 2 day breaks. 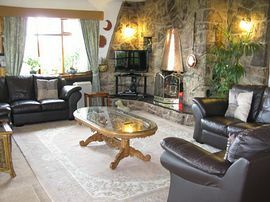 Bron Y Bryn Cottage: £350.00 to £700.00 per week. Short breaks available minimum 2 days. A fantastic place for celebrations. Bron Y Bryn Lodge: All year. Bron Y Bryn Cottage: March to December. Closed January and February. "Lovely house and magnificent views. Very nice location." July 2008 "We have had a lovely family holiday all of us together in this lovely house.Thankyou."